This year, the Sukkah in the Square was as successful as ever. 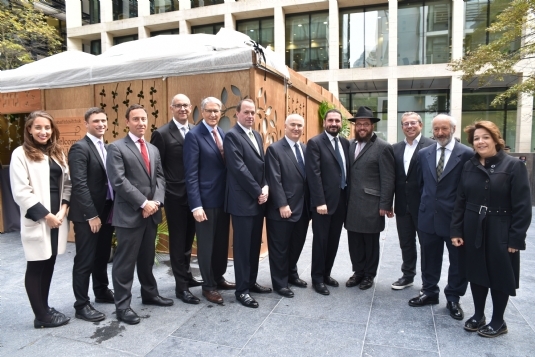 In partnership with Deloitte, Weil, TaylorWessing, Linklaters, Mishcon De Reya, The PR Office, Charles Russell Speechlys, and Hogan Lovells, Chabad Lubavitch UK were proud to build the Sukkah in the Square, (located in New Street Square EC4), for the seventh year in a row. On the Monday of Chol Hamoed, a lunch sponsored by Deloitte & Weil was held for over 400 city workers and on Tuesday, thanks to an anonymous sponsor, a Sushi Lunch was offered to a similar number. 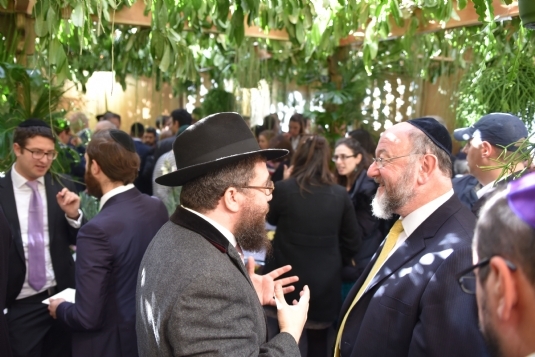 Rabbi Bentzi Sudak added that the Sukkah was so tightly packed you could “really feel its embrace.” The Sukkah is open each year on every intermediate day of Sukkot and hosts a variety of events including Young Professionals evenings and Breakfasts in addition to the main lunches.